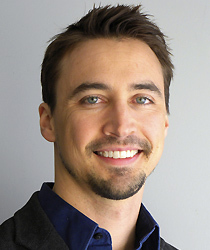 Jeremy Munday received his PhD in Physics from Harvard in 2008, his BS in Physics from Middle Tennessee State University in 2003, and was a postdoctoral scholar at Caltech until 2011 when he came to the University of Maryland. He is currently an Assistant Professor of Electrical and Computer Engineering with affiliate appointments in the Institute for Research in Electronics and Applied Physics (IREAP) and the Chemical Physics Graduate Program. His research endeavors range from near field optics, photonics, and plasmonics for solar energy conversion to quantum electromechanical phenomena (such as the Casimir effect) for actuating micro- and nano-mechanical devices. He has received a number of recognitions, including the NASA Early Career Faculty Space Technology Research Award. UMD engineers and scientists measure previously unexamined tiny force. Prof. Munday’s research project seeks to advance the understanding of the quantum vacuum and its potential use for future technologies. Researchers use an atomic force microscope to measure the Casimir force between two spheres. A paper co-authored by Prof. Jeremy Munday and graduate student David Somers has been published in the November 3rd issue of Physical Review Letters (PRL). The Junior Faculty Outstanding Research Award was established to recognize and celebrate exceptionally strong and influential research accomplishments by Clark School faculty at the assistant and associate professor rank.